So I’ve converted my bathroom into my new office. Kinda. It’s just got a great flow and an even balance of chi and aura. Or Perhaps it does. Nah I’m just kidding (I’m not one of those people). But I have found that it is very comfortable and for that reason I have decided to make it my new work place and let me say, it has been working out great. The loud fan drowns out all other noise and being able to lock the door allows me to block out all other people. Primarily Texas Toast because he has been on this annoying “I must play monopoly and scrabble with everyone” phase. No to say that I wouldn’t beat him into shame, but that’s not what I’m about and I would rather leave that to Rex because it is his job to be a jerk. But I truly have completed almost twice the work I normally would. The bathofficeworkroomplace is my new favorite room. It is not simply just for work. No, you sickos, not that. It is also a great place to blog, read, meditate, build models, etc. I love it. P.S. I am currently writing this in the bathofficeworkroomplace. Take it in. Take it all in, because soon I will have to go back out into the world. The cold, cold, ugly world. In other news I purchased an Anthrax CD yesterday. They have always been one of my favorite bands, but I noticed I did not have any of their CD’s. That’s sad. So I went to the exchange and texted my friend, asking him which Anthrax CD he thought was the best. He never replied so I ended up buying a “best of.” Now anybody who has ever bought a “best of” of a band that they truly like knows this is CD buying suicide. Fortunately this time the CD was actually pretty good and legitimately had all of my favorite songs on it. This rarely happens. Don’t chance it like me. EVER. 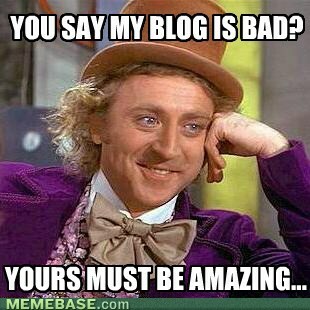 Don’t worry no one is demoralizing me by telling me I have a stupid blog (I could care less if they did anyway). And I’m not insinuating anything against anyone elses. But I figured this picture was semi appropriate.